We have a wonderful opportunity in worship this Sunday! It’s called The Observance of the Lord’s Supper. I know it’s not unfamiliar to us. And it’s not rare, but it’s not all that often that we observe it either. Only 4 times a year usually. So my prayer is that we do 4 things this week. Make this corporate worship experience a priority. Our observance of the Lord’s Supper is an instruction from God’s Word that requires our obedience. Prepare our hearts before as well as during the service. Pray and seek the Lord concerning unconfessed sin & anything we need to do in order to observe the Lord’s Supper in a worthy manner. Desire to honor & exalt the Lord in His sacrificial & substitutionary death on the cross. More than anything His death proves His love for us. 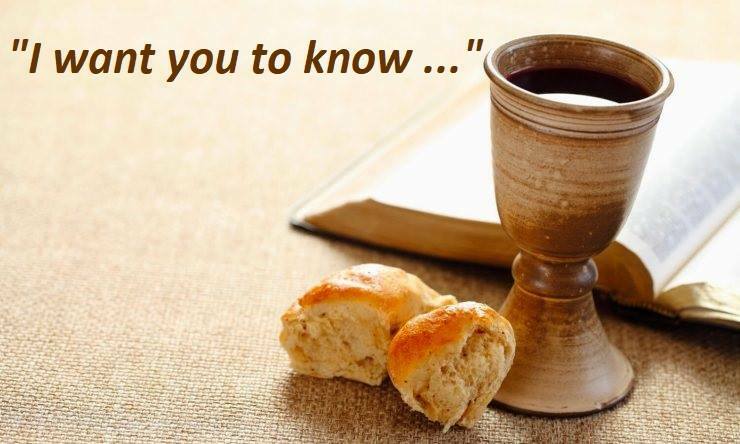 May our receiving the bread & cup be our way of showing our love & appreciation to Him for what He did for us. Express our witness & testimony concerning His death. As we partake of the elements we are showing once again our faith in & dependence on Christ for our forgiveness of sin. I hope you have a wonderful end of the week & may the Lord lead & bless you in it.